Sending out a forceful attack on the establishment and far-right politics, Roughneck Riot have served up a treat on their 3rd album, establishing themselves as not just one of the most premier bands in Warrington, coming on top of their successful headline appearance at Warrington Music Festival, but with sure signs of becoming fan favourites across the UK! ‘Out of Anger’ comes two years after the band’s previous album ‘This Is Our Day’, and other than dropping the streamlined name, what’s new from these Warrington heavy weights? The album on a whole displays a much stronger Folk element to their music, whilst the composition allows the traditional instruments to flourish, frontman Matt Humphries has lost none of his vitriolic delivery and barbed lyrics, over 14 tracks of politically charged protest tracks. A perfect example of the Roughneck Style is in the opening track on album, ‘Animosity’ which captures rip-roaring guitar riffs but also relentlessly fast banjo playing. One fan favourite is followed by another in ‘Parasites’ which has just had a video released. A look at the lyrics show the band have lost none of their hunger. Indeed it is not until almost half way through the album do the songs show any sign of slowing down. Even then it is short lived, but despite the title, Out Of Anger, it does have a feel good factor which encourages you to move and dance about. What is clear on tracks such as ‘Englands Desperate Liars’ (a not so discreet barb on current affairs in the UK) and ‘Never Silenced’, is whilst the the band is still capable of playing punk rock fast, they also have the confidence in their instruments to play more technical tracks and also have the maturity to write these parts to really show off their ability. This is in doubt helped by new members Samuel Bell & Tez Walker (Accordion & Drums respectively) who bring their own style to the bands sound. There is further contribution from both influencing the album in ‘This Green, Unpleasant Land’ & ‘The Last Of Us’, which respectively are about fox-hunting & the decline in skilled labour, which highlights issues close to heart. By bringing these viewpoints to the table, helps provide variety to the album. Roughneck Riot do not do boy-meets-girl songs! After a good few run throughs, with a smile on my face, what can we say? 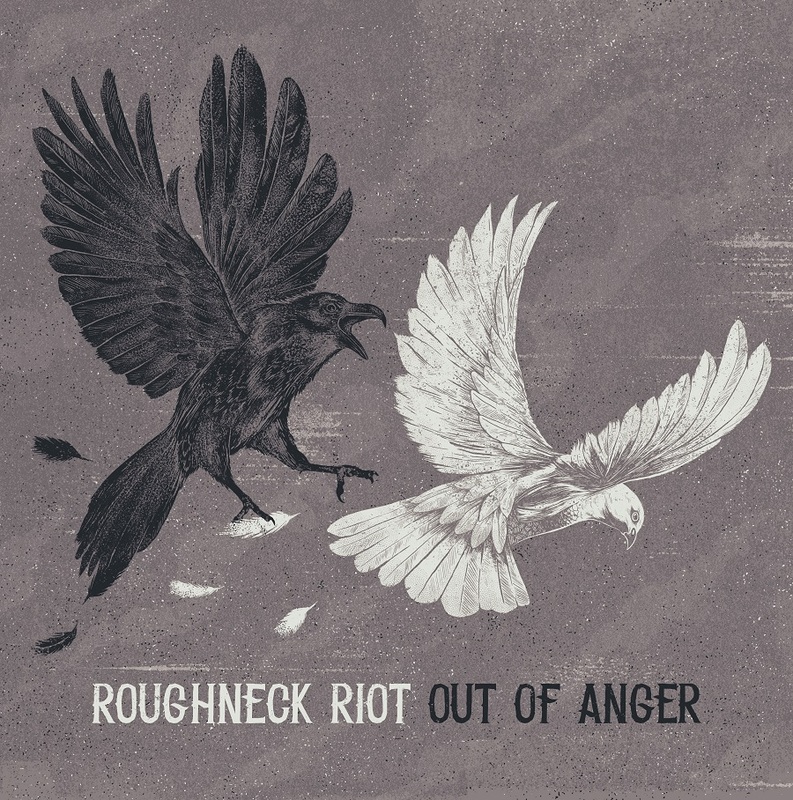 Well, Roughneck Riot have managed to blend together a perfect mix of folk-punk into a formula that works for them, and is a perfect representation of the band. The honest, emotive lyrics deserve credit and this kind of music is suppose to be enjoyed in a sweatbox venue and it is often impossible to sing along, that’s if you’re not already tapping your foot or throwing a fist in the air in solidarity of the bands DIY-ethnics and anti establishment leanings! As final track ‘He Never Came Home’ rings out, you realise this album confirms this band has the tracks to make a significant impact on not just the folk-punk community, but on the mainstream. Out Of Anger is just the start. ‘Out Of Anger’ is available from Monday 13th October from TNS Records, Head Music Store, iTunes & other good online stores.